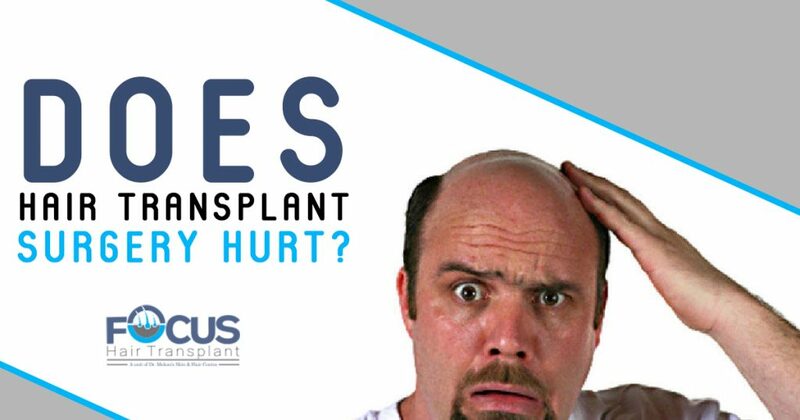 One of the most frequently asked question by the patients is whether the hair transplant surgery is painful or not. In most of the cases, the patient does not feel pain but he or she might have little discomfort and pain. But let’s first see how the surgery is performed. Hair transplant is one of the most effective ways to treat the problem of excessive hair fall which eventually leads to balding. During the hair transplant surgery, the hair follicles are taken from the back of the scalp and then transplanted on the affected area. Additionally, there are two ways in which the surgery can be performed which are FUE and FUT. In FUE, the hair follicles are taken from the back of the scalp and then they are transplanted one by one where the hair growth is very less. This process takes more time as grafts are transplanted one by one. The benefit of this process is that it does not leave a scar on the scalp. In FUT, the strip of hair is taken from where hair growth is more and then it is transplanted where hair growth is very less. This process does not take much time but it does not leave a linear scar on the scalp. In the last few years, there are many patients who have opted for this treatment not only to solve the problem of hair fall but to later their hairline. People are opting for this treatment because the results are effective and it also gives natural looking hair. This is one of the first questions we are asked from time to time. The surgery is not painful whether you choose FUE or FUT procedure. In addition to this, it also depends on how much pain you can bear because some people cannot tolerate pain at all. For this, the surgeon makes sure that he uses all the methods to make the surgery painless. Before the surgery starts, the patient is given local anesthesia to the area of the scalp. Due to this, the entire area is numb and the patient does not feel anything. Additionally, this reduces the discomfort throughout the procedure. Although the patient is awake throughout the entire procedure and they know what is going around them. So, you can say that the entire process is relatively painless. Our main aim is to make the patients feel comfortable during the entire surgery. After the surgery, you might feel some pain and discomfort because the follicles are grafted from one place to another. Your scalp might sore and red for a few days. If the treated area is large (transplanted grafts are more) then it might take longer to heal and recover properly as compared to others. Generally, the pain and discomfort last for not more than two weeks. Your surgeon will prescribe you pain relief medication so that you don’t face any issue even after the surgery. However, if you feel you are experiencing a high level of pain for a long time then you should visit the surgeon.